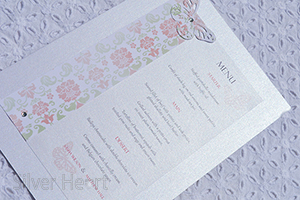 Menu designs, Silver Heart Wedding Stationery,various formats including tall and square gatefold, and flat menus. Wedding stationery suppliers to Huddersfield, Leeds, Wakefield, Holmfirth, West Yorkshire, Yorkshire. 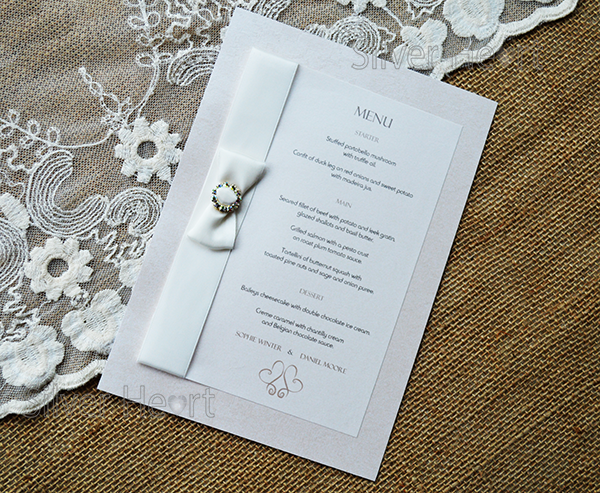 Why not have beautiful menus to match your other stationery and wedding theme? Our menus are created to match all our designs perfectly. 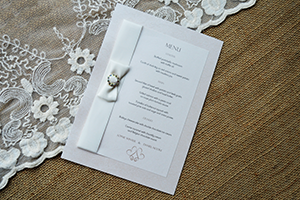 Inserts provide your guests with an outline of your chosen menu to get their taste buds tingling. 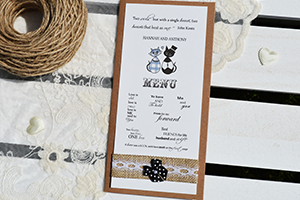 We also create bespoke menu designs to match any theme that you may have. 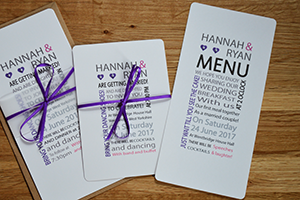 For instance, you may want a particular colour of satin ribbon, broderie card or gems for your invitation to match your colour scheme. We will do our best to help! N.B. There are some menus that are unique in format such as the Hannah menu seen in the image above. Simply contact us for exact prices. 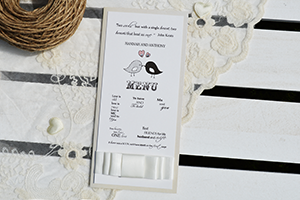 We also do Save the Date, Day Invitations, Evening Invitations, Order of Service/Day, Place Names, Table Names, Thank You Cards and Table Plans.